Synopsis: An introduction to teaching methods and models. From the Publisher&colon; FREE STUDENT MANUAL: Each copy of the fifth edition comes with a free student workbook, Learning Aids for Planning, Observation, and Portfolio, which includes over 100 pages of structured observation, interview, and reflection guides, along with portfolio exercises. 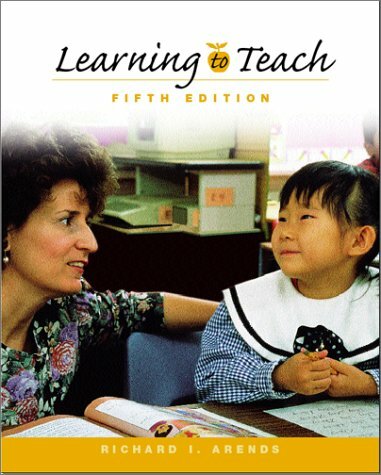 FREE STUDENT CD: Each copy of the fifth edition comes with a free Student CD-ROM called Making the Grade. The free CD includes a learning styles assessment, an Internet primer, a Guide to Electronic Research, a study skills primer, a link to the Learning to Teach Online Learning Center Web site, and 15-25 test questions per chapter with feedback. ENHANCED DESIGN: The fifth edition is much friendlier and student-oriented with a new, inviting, open, one-column design. REFLECTIVE: A new, engaging chapter opening feature, Reflections On', prompts the student to think about their own experiences related to the chapter material to follow. EXPERT: Comprehensive and balanced, the text expertly covers all major teaching models. ADDED FEATURES: New features include Tailoring Teaching for Diversity boxes which describe how to adapt instruction for students with special needs and Spotlight on Technology boxes which highlight how technology can be used to enhance the chapter's topic. New Check for Understanding sections at the end of each chapter section provide brief reviews of content for the student. New notes in the text margin throughout the chapters help students focus on the most important material. CASES: Each chapter-ending Reflection and Portfolio section includes a brief case that asks the student to reflect on it based on the chapter's content. In-service teacher reflections on the case are provided as well. UPDATED: Each chapter has been updated with 50 to 100 new references. INCLUSION & MULTICULTURALISM: Much more care has been taken with Chapter 4, now called 'The Inclusive and Multicultural Classroom.' Much more and newer content has been included in this chapter. CHAPTER CHANGES: Former Chapters 14 and 15 have been combined into new Chapter 13, now called 'School Leadership and Collaboration' in response to user feedback. Former Chapter 13 on Learning Strategies was shortened and moved to the Resource Handbook at the end of the text. KNOWLEDGE BASE: Theoretical and Empirical Support sections in each chapter provide a broad sampling of the knowledge base that underlies and supports the recommended teaching practices found in the latter part of each chapter. Students are shown why a recommended procedure or principle works the way it does, not just how to execute it effectively. Learning to Teach remains the most research-based text in the field. RESCOURCE HANDBOOK: The easily referenced 30-page Resource Handbook at the end of the book provides detailed information on (1) Reading and Using Research, (2) Action Research for Classroom Teachers, and (3) Learning and Study Strategies. COMPING GUIDELINE: Well-respected text and author, a 'known quantity' class act that most general methods professors will be interested in. BOOK'S POSITION: Comprehensive, research-based best-seller; first-class coverage of all major teaching models plus planning, classroom management, assessment, motivation, and use/management of time and space.